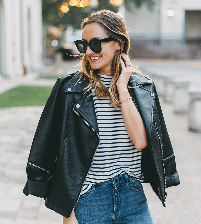 Now, this may come off as a surprise; however, leather jackets are a trend that maintained its popularity in the winter and is gradually appearing during the summer time too. When the weather starts to get hot, that’s a different story, but I have seen many people wearing these jackets on the New York City streets. I noticed them a lot when I was in Italy for a semester in the fall. Whether it was 80 or 40 degrees, people wore leather jackets, Europeans, and Americans. When noticing this trend, I bought a few leather jackets and currently wears it until this day. Whatever color jacket, it can be paired with something dressed up or dressed down. It’s like picking out a new car; you want it to be sleek, chic, and perfect. You may think that leather jackets are too stiff to wear in the morning; however, some trendy outfits can be made at 10 a.m. when running errands. When attending school, early meetings or doing a quick errand to the food store; I sometimes pair my leather jacket with a lightweight hoodie. It provides a soft layer along with my thick leather jacket, giving the jacket a casual vibe. I pair this with one of the numerous pairs of black leggings I have, usually Lululemon, and a pair of cool sneakers. Sometimes I will wear my black Nike running sneakers, or if I want to be creative, I will pair the outfit with a pair of platform sneakers. Wearing this outfit, I am comfortable and ready to start the day. Oh wait, let me grab a pair of big, obnoxious sunglasses! Now jumping into the middle of the day, where most of your plans take place, and being comfortable, casual, chic, and edgy all need to tie into one outfit. Similar to the morning, but changing some pieces can make it all happen. Wearing a pair of cute jeans, ripped or not, with a loose t-shirt or cami, and some platform sneakers are perfect. This look can go for running around the city, getting lunch with friends, shopping, and any daily activities that you need to accomplish. Wearing sandals is also lovely when the weather is warm in the spring and summer time. One tip is not to wear the jacket at all. Just place it over your shoulders and make a show-stopping statement! A night out in town for a nice dinner and rooftop drinks, wearing a cami or lightweight long sleeve top with a leather jacket, jeans, and heels is the go-to style. It shows off a casual, dressy, and fun side to your wardrobe and personality, and is something that can go with all colors and accessories. This is where having a fun colored leather jacket comes out because the evening is when it is most noticed. The color pops when its dark at night and everyone can see. Again, if you don’t want to wear the jacket, you don’t have to. Just hold it over your shoulders and take some cute pics with a glass of wine at the bar. Now, that is an eye-catching scene. What if I told you that one accessory could be added to any of your leather jackets, and the time of day does not matter? I know right, I can’t believe it either. Scarves are a go-to when being comfortable, adding some color or neutrals to your outfit, and is a main accessory in the cold months. I personally always wear infinity scarves in the winter. The bigger, the better. Just think about this article of clothing. As for how I like it best… don’t get me started.